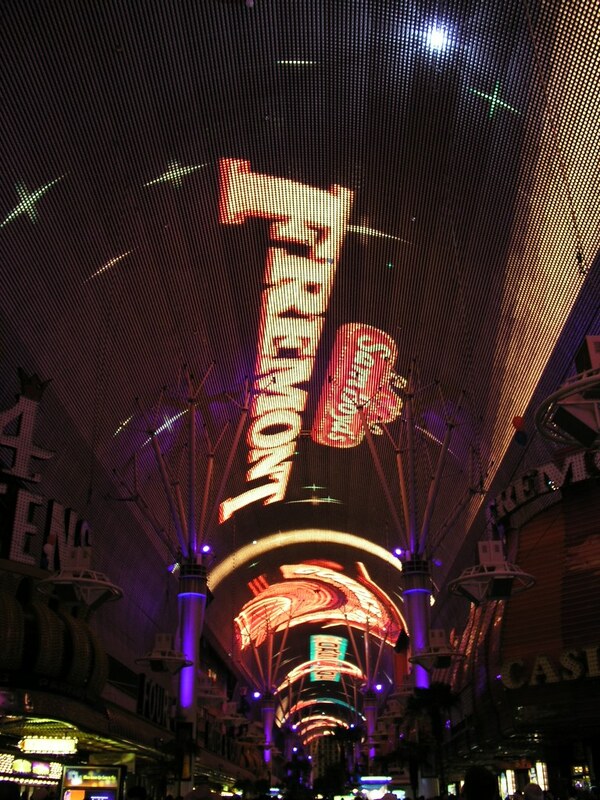 Star Trek: The Experience, Fremont Street, and Penn & Teller. 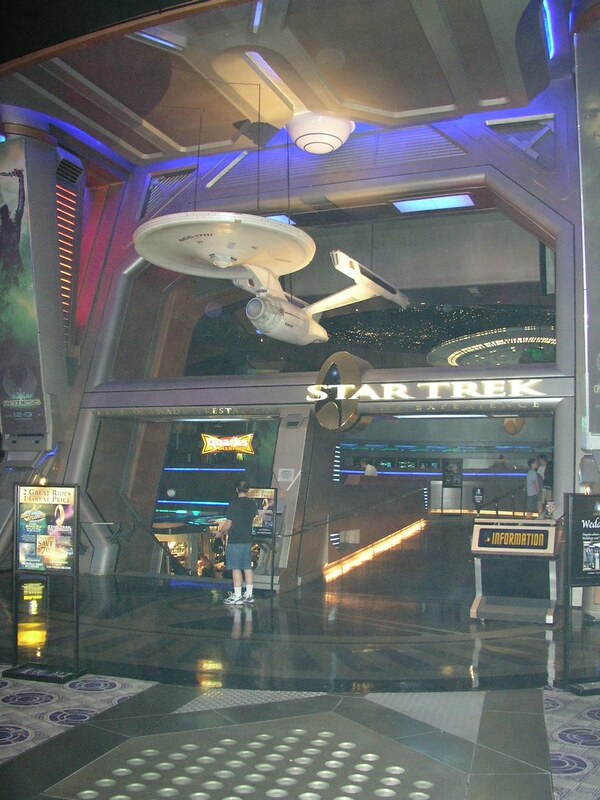 Sadly, this attraction was dismantled and is no more. 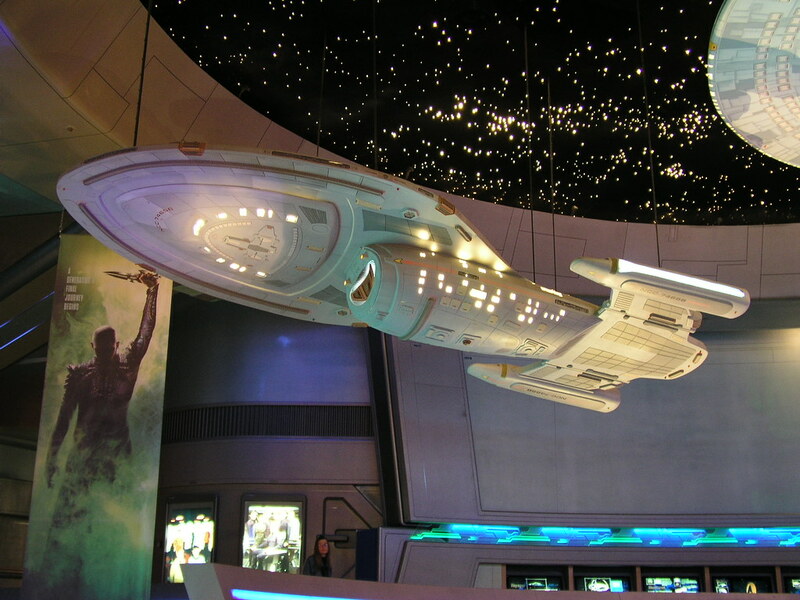 Several very large ship models hung in the entry area. 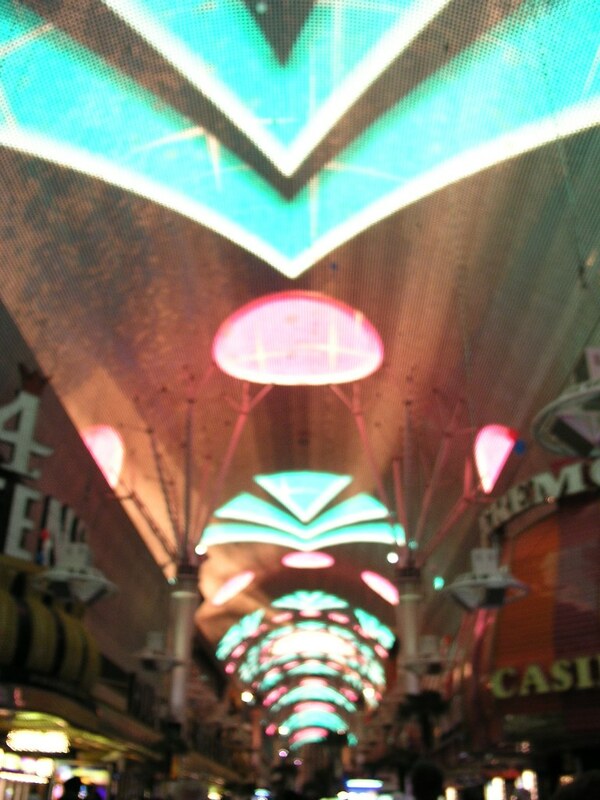 I have no clue whether or not they were film models, but I doubt it. 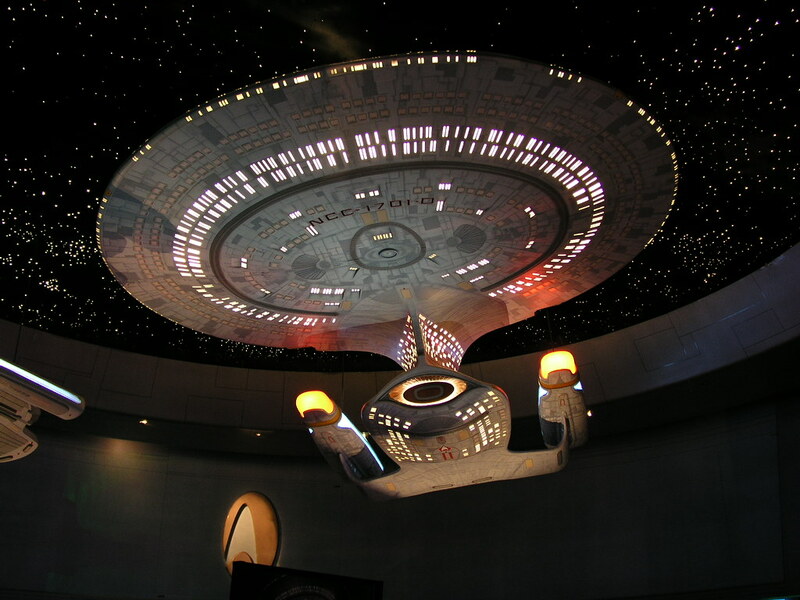 This is the movie era USS Enterprise. 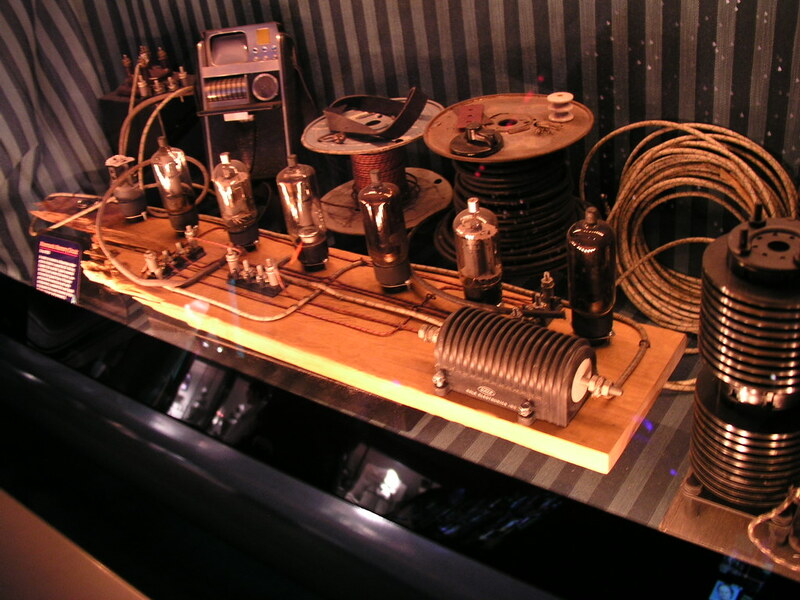 Spoke's mnemonic memory circuit prop from the episode, "The City On the Edge of Forever." 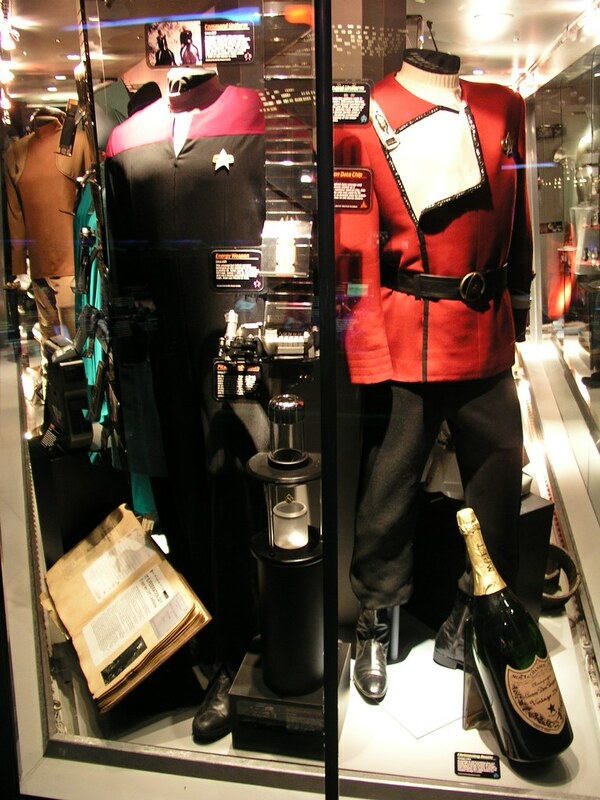 Left to right: uniforms of Uhura and Kirk from the original series, and a uniform from the Enterprise series. 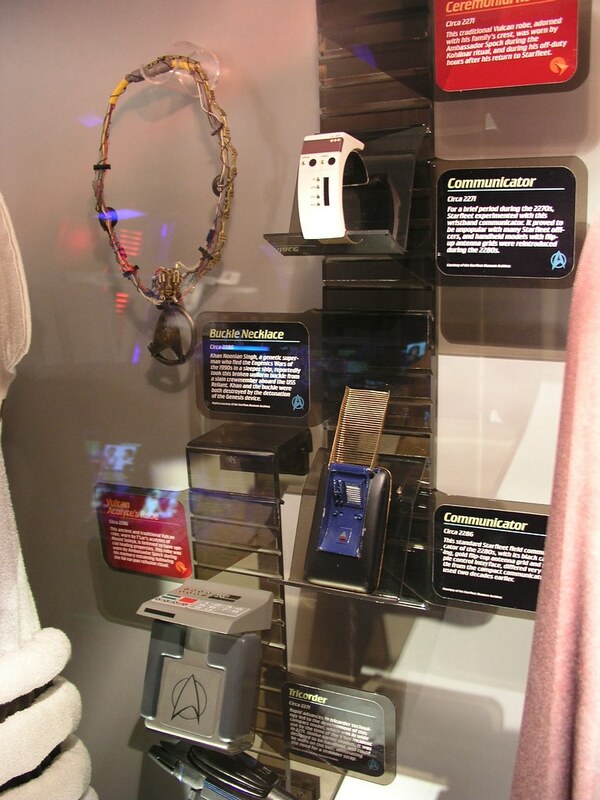 Khan's necklace, communicators, and a tricorder. 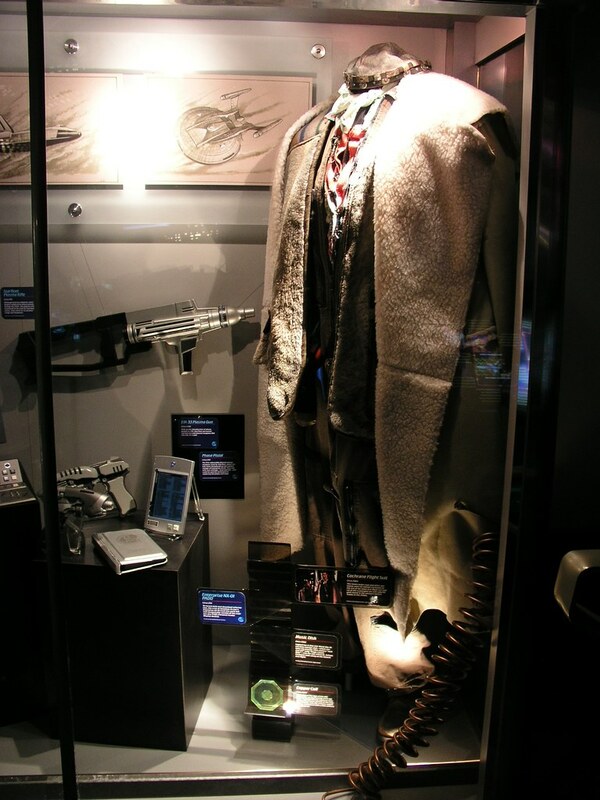 Spock's Acolyte robe from The Search for Spock and The Voyage Home. 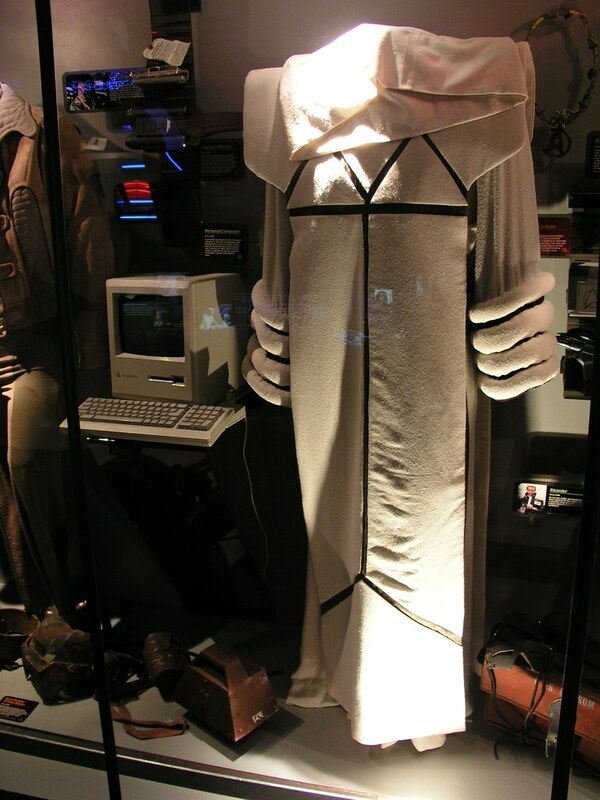 Also seen is the 1986-era Macintosh computer Scotty used to draft designs for transparent aluminum. 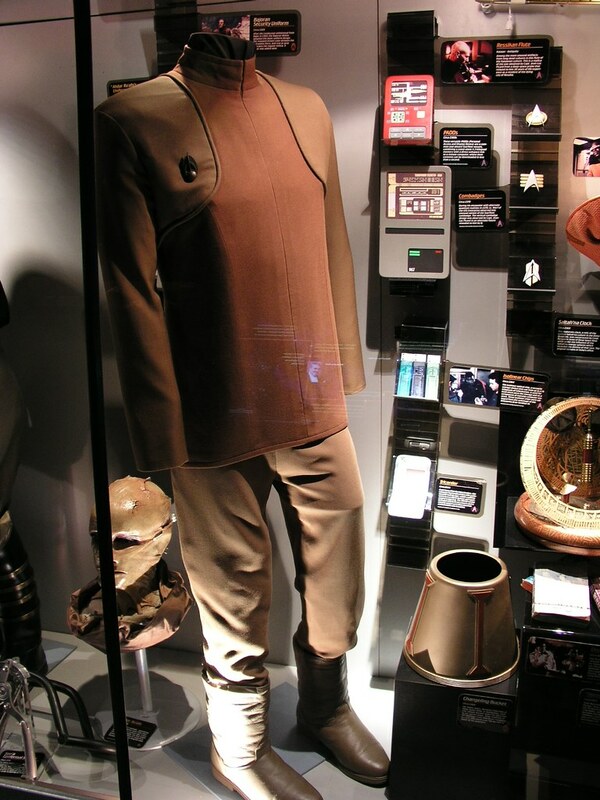 McCoy's clothing from The Search For Spock and The Voyage Home. 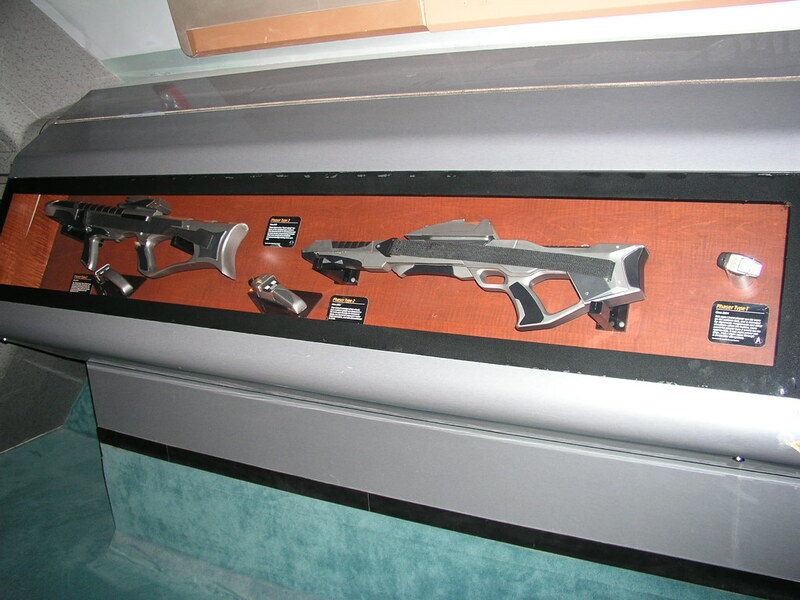 Also some props from The Undiscovered Country. 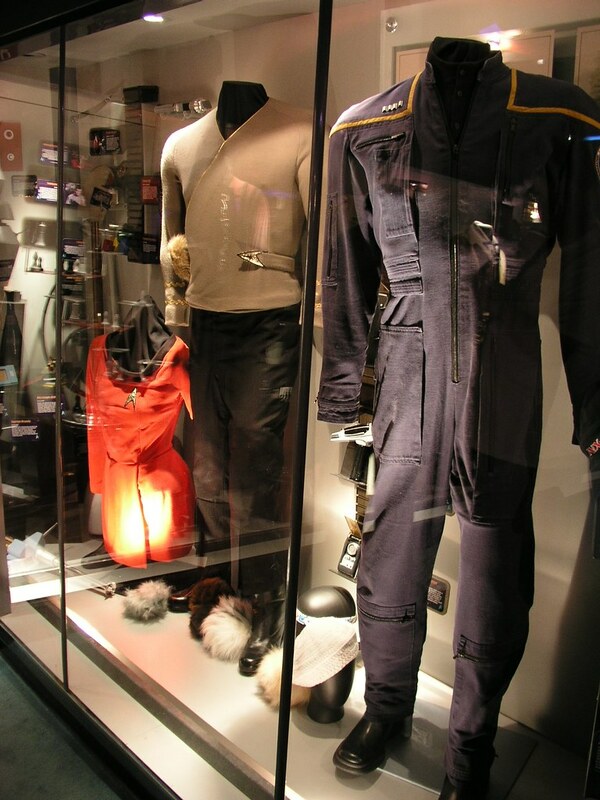 Left: a jumpsuit uniform first seen on Deep Space 9 and, subsequently, on the latter episodes of The Next Generation and virtually all of Voyager. 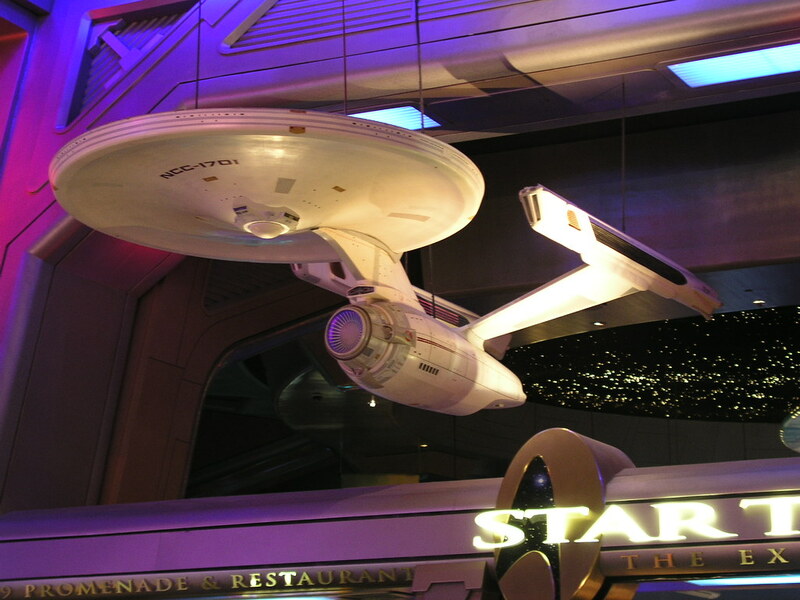 In the bottom right corner is the christening bottle from Star Trek: Generations used for the Enterprise B. 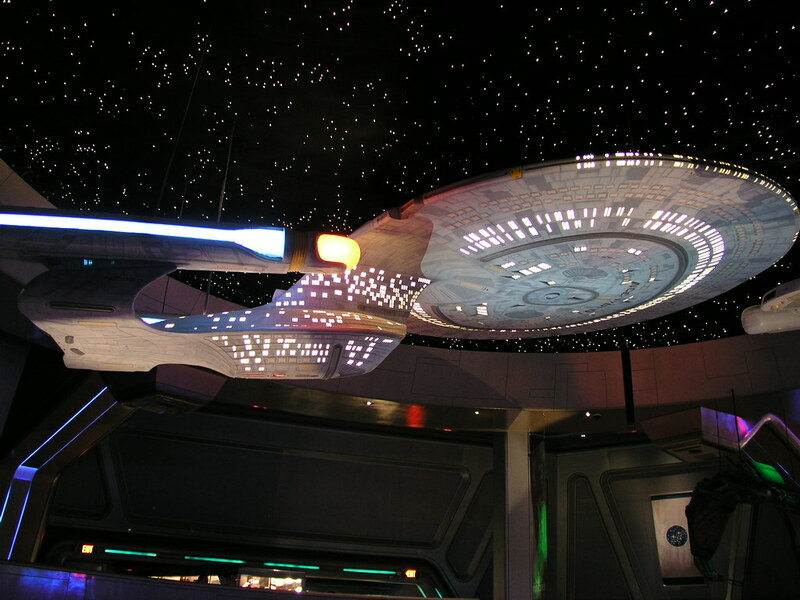 Yes, the prop was really that large to allow for better detail during filming. 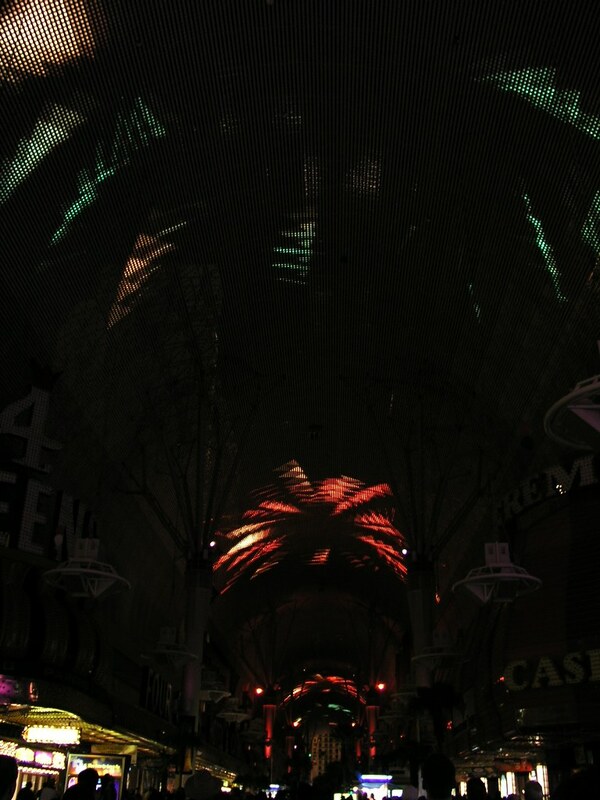 Sorry about the glass reflection. 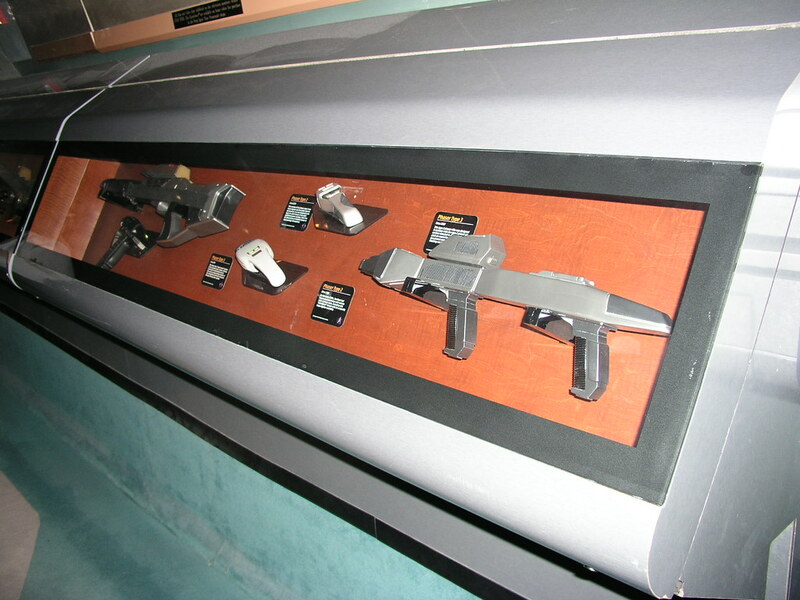 This case contains various Next Generation props including medical devices, a tricorder, and a PADD. 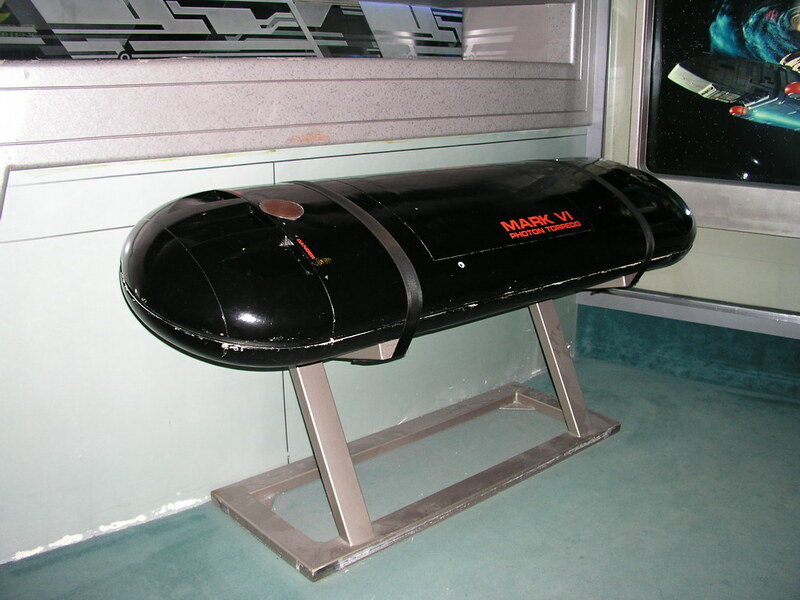 Pooey, the photo doesn't include the info badge for these props. 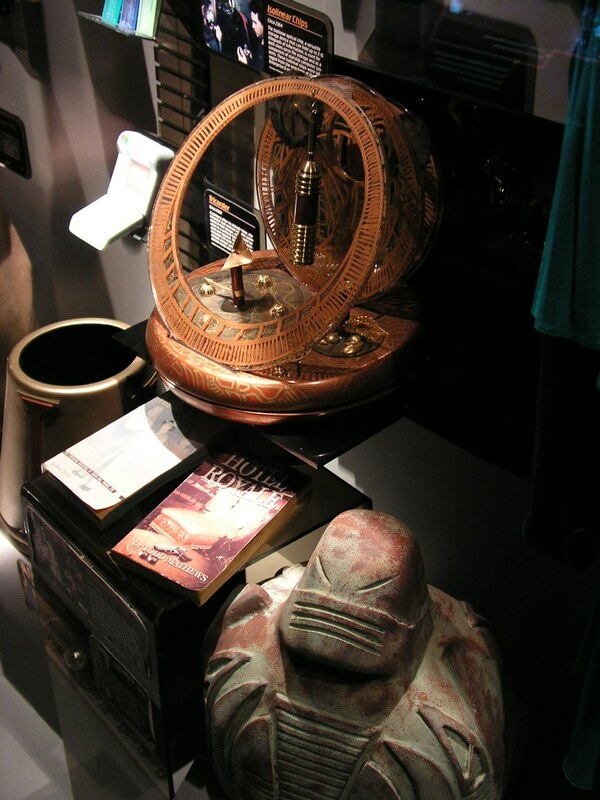 The upper item is a Saltah'na clock built by Sisko on Deep Space 9. 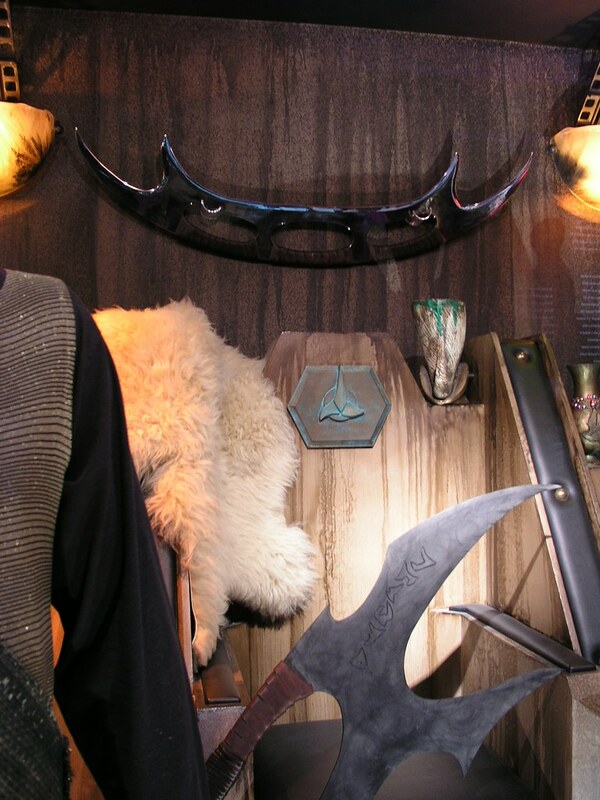 I'm really not sure what the art item at the bottom is, but I vaguely remember seeing it. 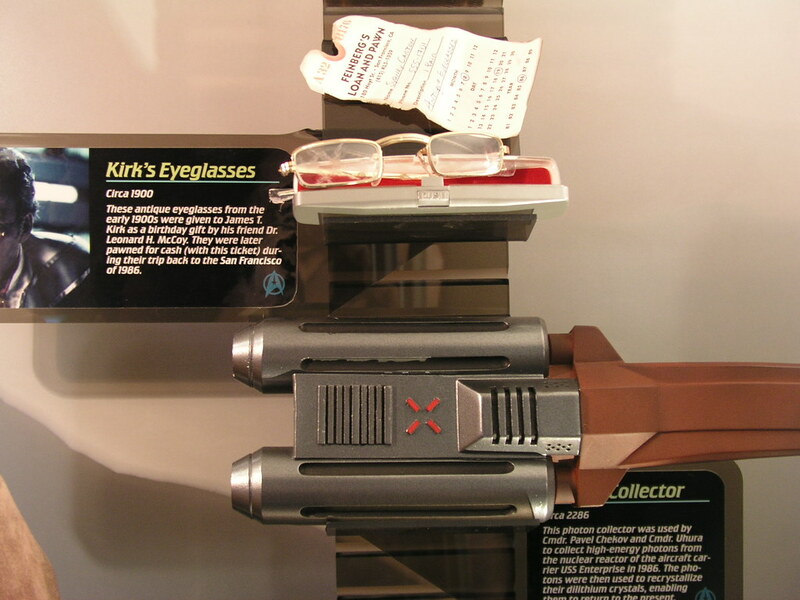 Picard's Ressikan Flute from the episode, "The Inner Light." 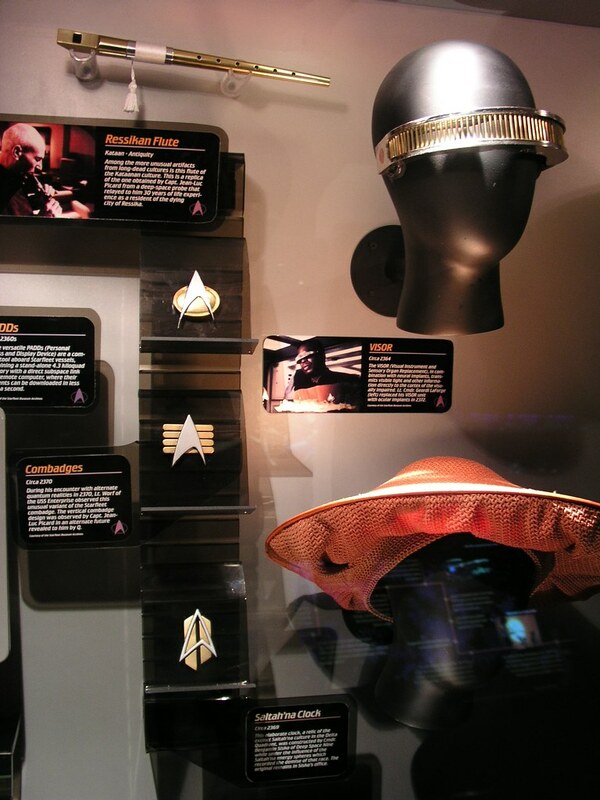 Also: Geordi's VISOR and various combadge designs. 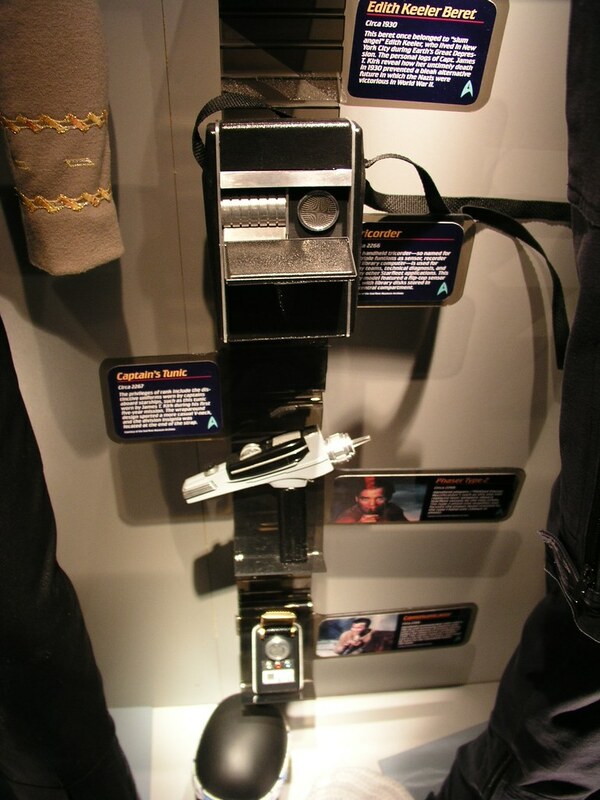 The second and third badges were seen in alternate reality scenes and, technically, don't actually exist in true Star Trek events. 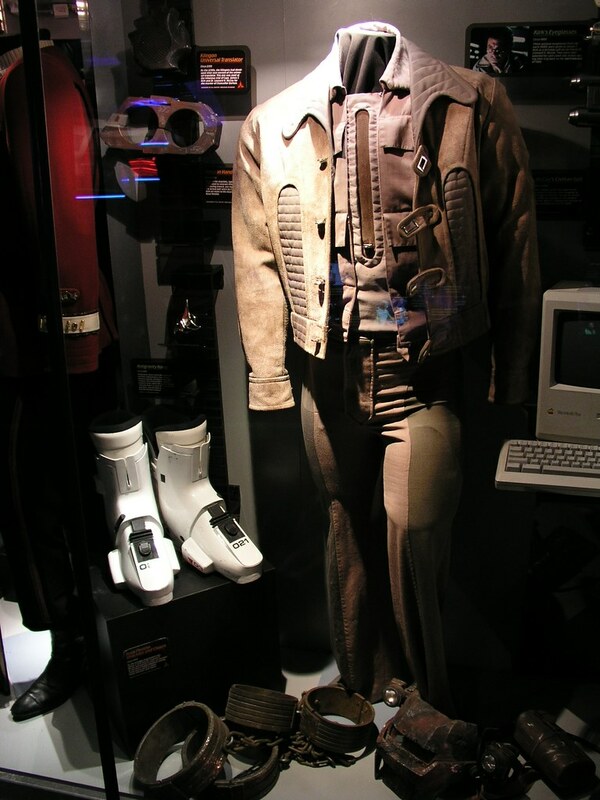 Odo's uniform and bucket from Deep Space 9. 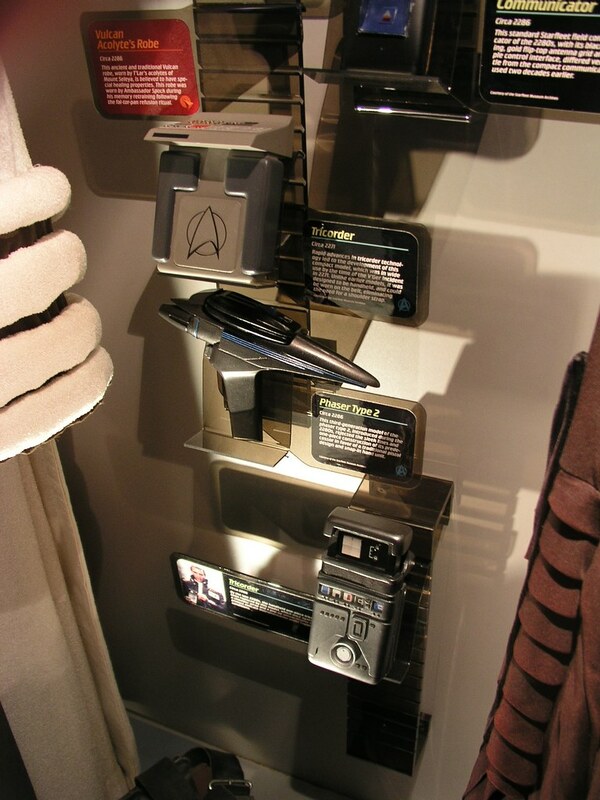 Also, several PADDs, a tricorder, and the head makeup for a Son'a from Insurrection. 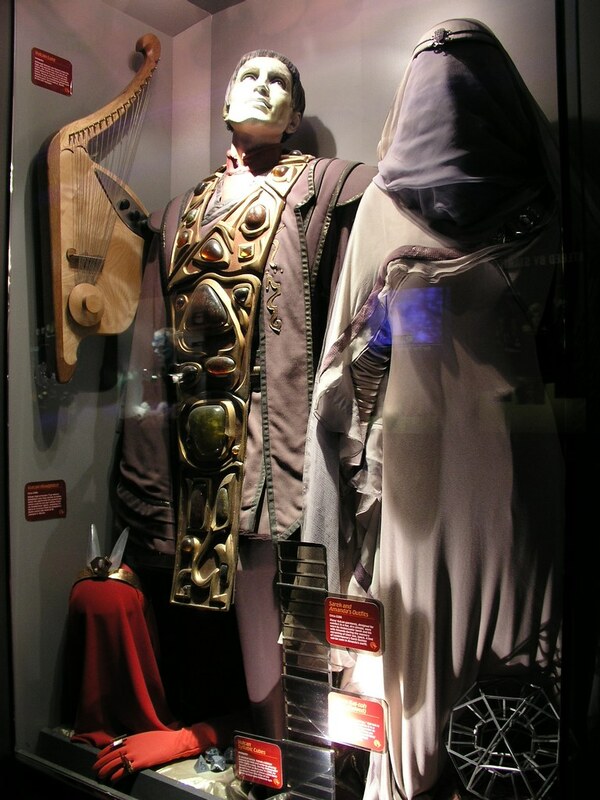 Vulcan props including costumes for Sarek and Amanda, a Kal-toh puzzle, Syllabic cubes, a headpiece, and a lute. 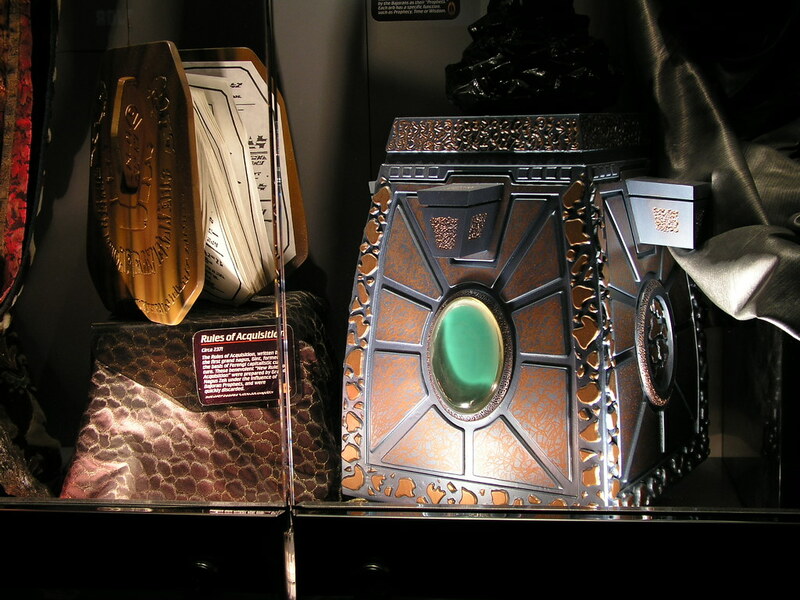 The Ferengi Rules of Acquisition book and a Bajoran Orb of the Prophets container. 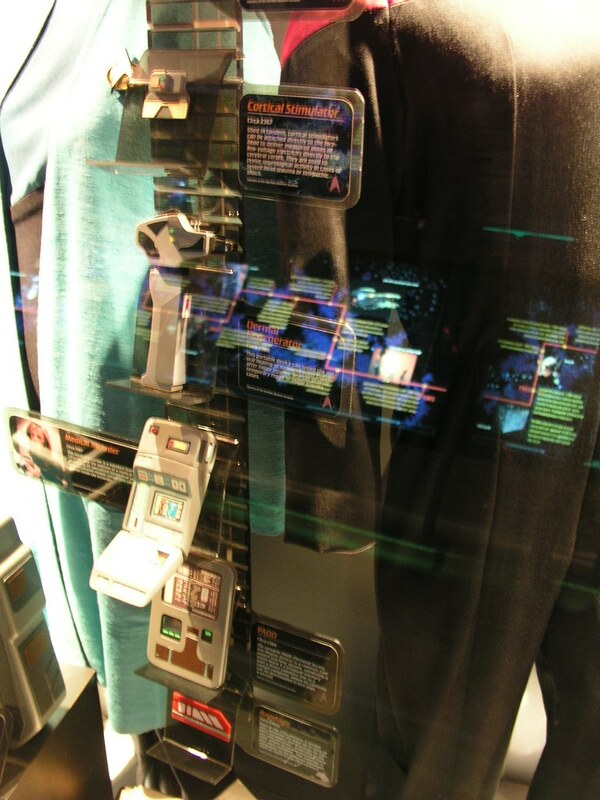 From Wrath of Khan and Search For Spock. 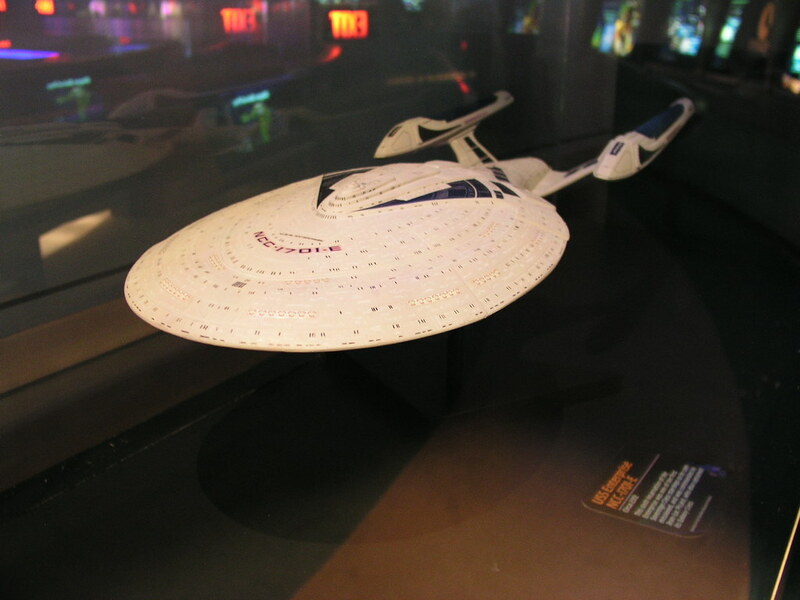 My understanding is the Enterprise E seen in films has been entirely digital graphics, so this model is purely for representation purposes. 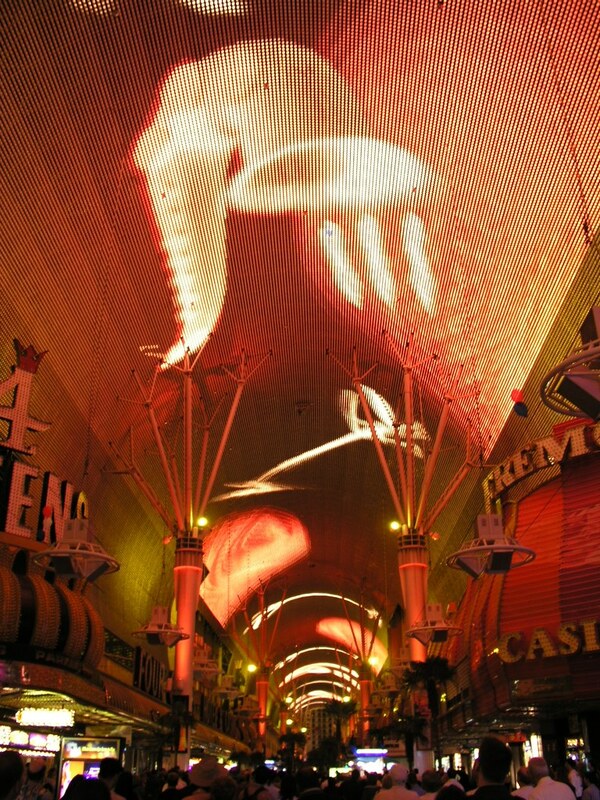 Fremont street, located about three miles north of the Las Vegas Hilton. 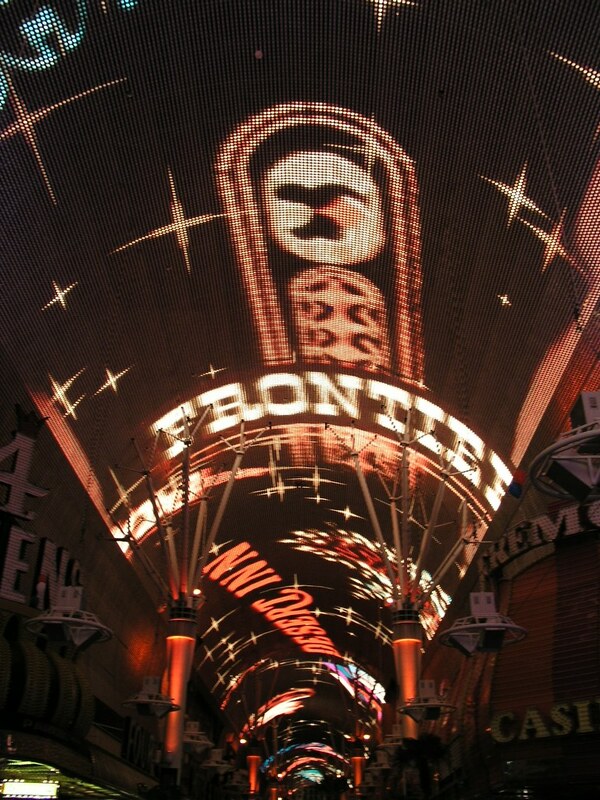 From the official web site, "The space frame towers 90 feet above a four-block section of Fremont Street and serves as a display system for the shows. 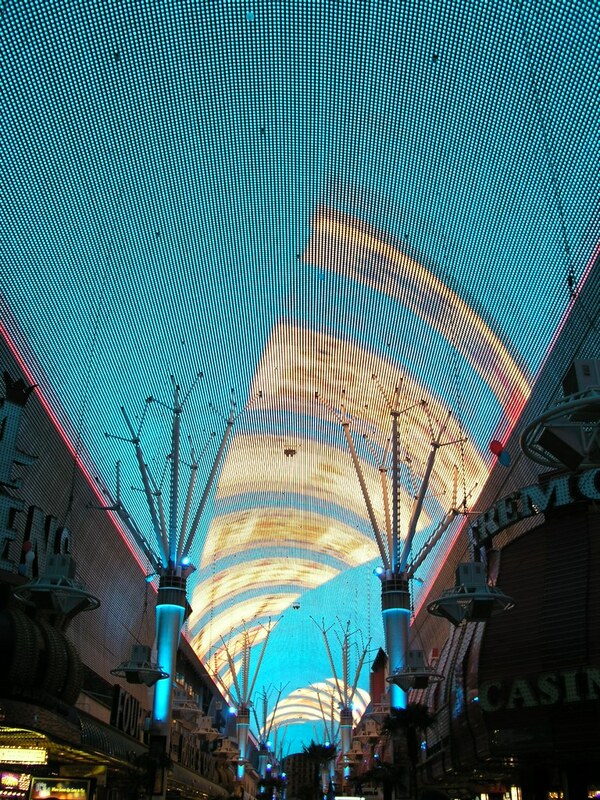 The canopy houses 2.1 million lights, capable of producing millions of color combinations and 540,000 watts of concert-quality sound. 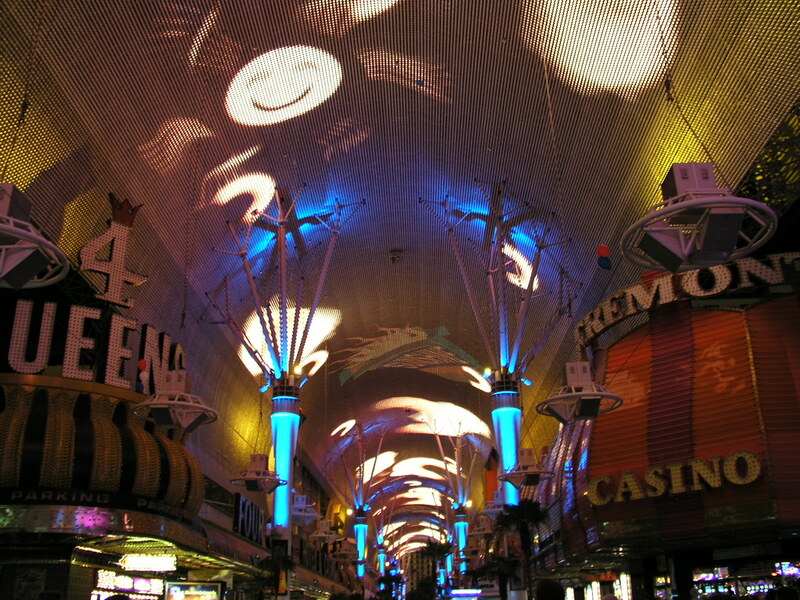 The shows are run by 36 computers and are accompanied by 218 speakers. 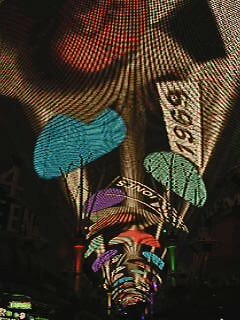 In addition, the canopy houses 180 computer-programmed high-intensity strobe lights, 64 variable color lighting fixtures, and eight robotics mirrors per block that pan and tilt to reflect light, all of which aid in the miraculous display of each six minute Light and Sound show presentation." Of course, these statistics from 2003 may be completely different/expanded today. 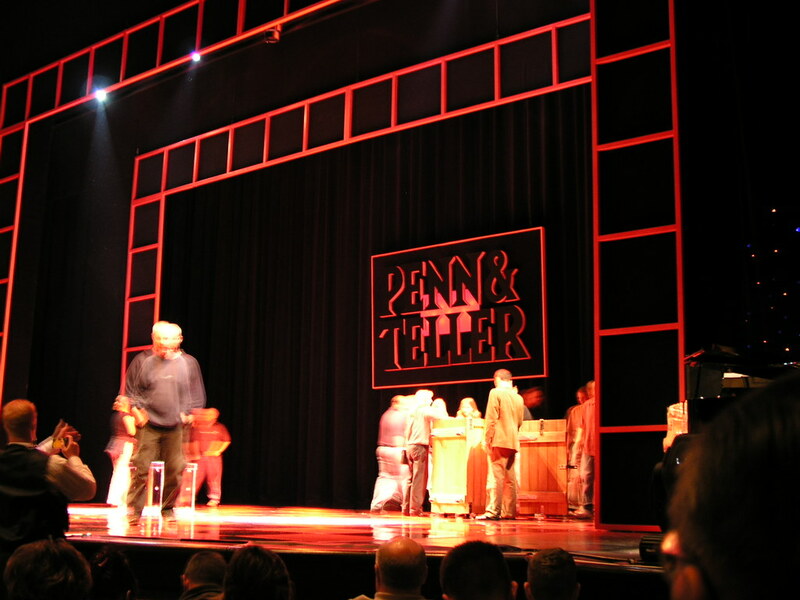 Photos were not allowed during the Penn & Teller show, but the audience was encouraged to examine some boxes on the stage that Teller would later escape from and cameras were not nixed until the show actually started. 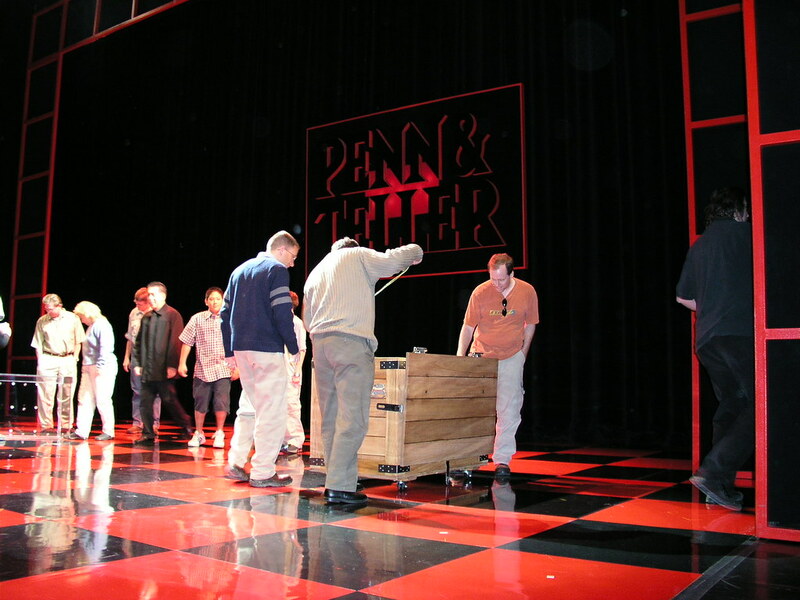 Did you notice in the prior photo, besides this wooden box, there was also a plexiglass box on stage right? 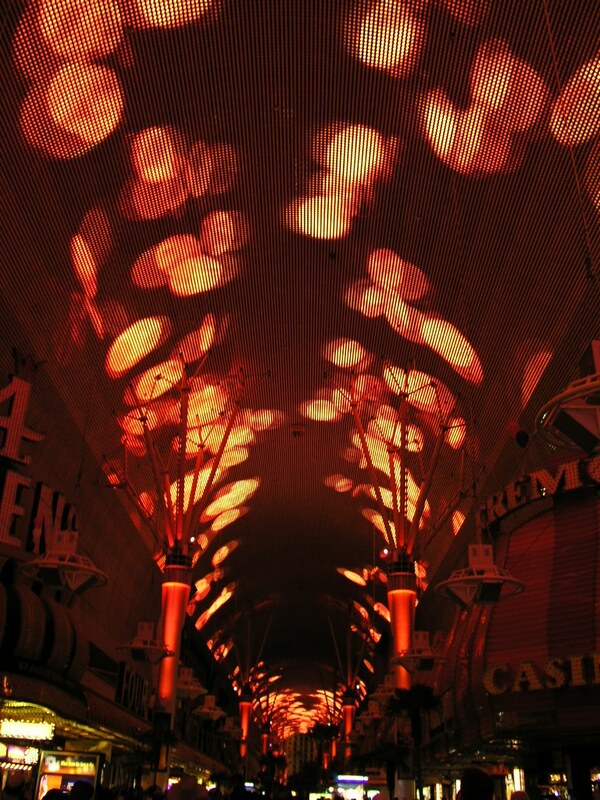 It was used to show how the trick was done. 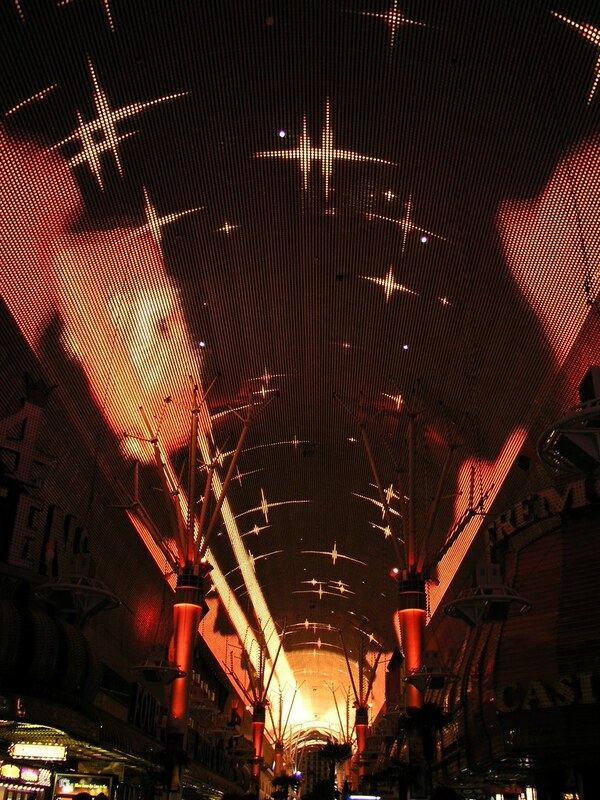 Wider shot showing the stage backdrop a little better.